After breakfast in Arusha, drive to Tarangire to discover the giant termite mounds and baobab trees of Tarangire. This park is famous for its large elephant population, scenery and diversity of birdlife. Overnight at Tarangire Campsite, located just outside the park boundaries. Tarangire's wildlife includes elephant, lion, giraffe, warthog, ostrich, impala and baboon. Leave the campsite at 8am for an all day game drive in Tarangire. Eat a packed lunch in the park overlooking the Tarangire River. Return to the campsite at 6:30pm for dinner and overnight. Leave Tarangire after breakfast for Lake Manyara National Park. Arrive in Manyara at approximately 10am and go on a game drive until 1pm. Return to the campsite for a hot lunch and then go on another game drive from 3pm until 6:30pm. Return to Jambo Campsite for dinner and overnight. Go on an early morning game drive from 7am until 9am. Return to the campsite for brunch. Leave at 10:30am for Serengeti National Park. Pass through Ngorongoro Conservation Area along the way, pausing to view the Crater. As you drive to your Serengeti campsite, game drive along the way viewing the park’s resident and migratory animals. 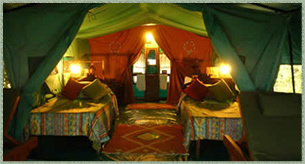 Overnight at Seronera Campsite, located in the heart of the Serengeti. Species commonly seen in the Serengeti include wildebeest, cheetah, zebra, lion, giraffe, impala, topi, and leopard. The Serengeti is also home to more than 540 species of birds. Spend a full day in the Serengeti viewing the wildebeest migration. Return to the campsite for a hot lunch. Spend another full day in the Serengeti viewing the park's resident carnivores and the wildebeest migration. Dinner and overnight at Seronera Campsite. Spend the morning in the Serengeti. Eat lunch in the park before leaving for Ngorongoro Conservation Area. Arrive at the Crater rim campsite in time for the spectacular sunset. Dinner and overnight at Simba Campsite. At 7am, leave the campsite for a six-hour game drive in the crater. The largest unbroken caldera in the world, Ngorongoro has an area of 260 kilometers and a depth of 610 meters. The crater provides a protected habitat for thousands of mammals and birds. At 2pm, leave the Crater to return to Arusha. Resident Crater wildlife includes lion, hyena, elephant, wildebeest, zebra, black rhinoceros, flamingo, hippopotamus, and cheetah.